Dr. Heidi Morgan, Dr. Julio Ibarra, and Jeronimo Bezerra participated in TNC 16 with presentation “Coexisting Production and Experimental Testbeds: The AmLight experience after one year” at the session “SDN data plane”. 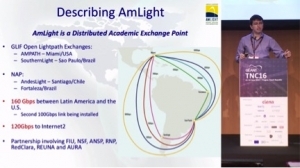 The article presented by Jeronimo Bezerra describes and discusses how production and experimental networks may coexist using the same OpenFlow-controlled infrastructure, represented here by the Amlight community’s network connections between North and South America. In order to avoid undue interference with production traffic, the team has developed a sanitizer module, which filters and validates the controller messages used by the experimental networks. The TNC16 Networking Conference is the largest and most prestigious European research networking conference, with more than 650 participants attending this annual event. TNC brings together decision makers, managers, networking and collaboration specialists, and identity and access management experts from all major European networking and research organizations, universities, worldwide sister institutions, as well as industry representatives. Through keynotes speeches by renowned specialists, varying parallel sessions, demonstrations, and presentations, the Conference presents participants with a unique overview of the latest developments in research networking, both in the technical field and in the area of application and management.